Many University of Indianapolis Krannert School of Physical Therapy faculty are in Washington, D.C. for the American Physical Therapy Association’s Combined Sections Meeting. Emily Slaven, KSPT associate professor and president of the Indiana Physical Therapy Association, had the opportunity to meet with U.S. 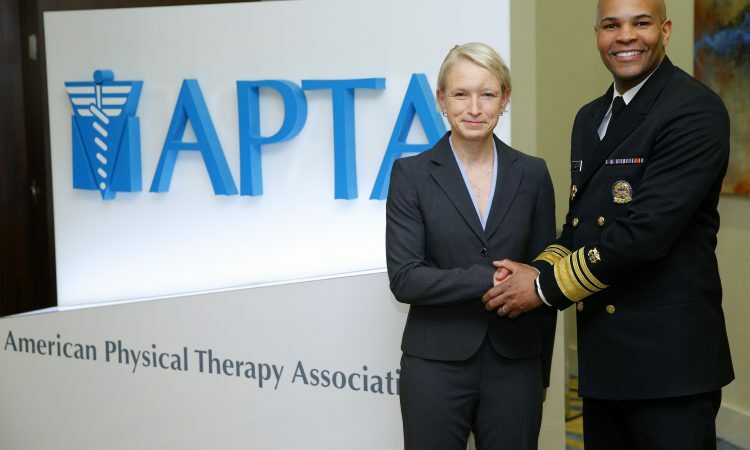 Surgeon General Jerome Adams, MD, ahead of his keynote address to APTA leadership. During his keynote, Dr. Adams addressed the challenges of the opioid epidemic. He noted that he and his office are strong supporters of alternatives to opioids such as physical therapy which centers on movement, hands-on care, and patient education. Prior to his appointment to US Surgeon General, Dr. Adams served as the Indiana State Health Commissioner from 2014–2017. Stephanie Combs-Miller, associate professor and CHS director of research, and Elizabeth Moore, assistant professor: “Physiological complexity of gait over the first six months post stroke.” Student presenter: Tiffany Wong (OT). Connie Fiems, assistant professor: “A qualitative study of physical therapists’ views on specialty certifications in brain injury: Novice and experienced clinician attitudes and beliefs.” Student presenters: Katie Shew, Brian Wong. Stephanie Combs-Miller, associate professor, and Nathan Eckert, assistant professor: “Activities and cognition improve after three months of boxing for people with Parkinson disease: A preliminary analysis.” Student presenters: Caitlin DuVall, Mackenzie Garreth, Kaitlyn George, Sophia Gerber.